Q: Johannes Gutenberg! What an honour it is to meet the very man responsible for the many things we monopolise today! A: *chuckles*. The honour is mine. It’s my first time being interviewed for my inventions, I’m honestly very pleased that what I intended to do continued to gained momentum and that I’m somewhat being recognised for playing a role in the mass printing process. Q: It was certainly very difficult to score an interview with you. Physically transporting you from the 14th century to the 21st was no easy feat, it required a lot of manpower! *laughs* Now I’m sure from your perspective everything you’ve seen is rather overwhelming, isn’t it? A: Absolutely. It’s quite startling to physically see things I could only ever imagine. To witness how far publishing books and other mass-producing media has come… it’s truly a spectacle to behold and I still fail to understand how many machines operate. This… *gestures to the mic* for example… a machine that is capable of capturing audio and record sounds… it’s utterly baffling. Q: Why don’t we focus on other matters at hand. According to your documents, you were training as a blacksmith before you decided to suddenly pursue your printing press ideals. What drove you to carry out such a magnificent ordeal? A: My blacksmith knowledge was initially what lead me to other possibilities. Tinkering with machinery allowed me to build an understanding of metal properties and that was then where I discovered a new alloy that was optimum for type production. This made me question and think to myself, ‘Johannes, why don’t you put your skills to use and make something useful that people will remember for generations!’. I was quite idealistic back then and I possessed a certain curiosity and hopefulness that I could contribute something incredible which would alleviate every humans’ accessibility to literacy. Q: Did you realise how impactful your inventions would later become? Your legacy continued for hundreds of years, until the design was enhanced and refined by another fellow. Q: Could you tell me a little about what happened during the first mass printed book, The Gutenberg Bible? A: Certainly. In terms of the process, it took a large amount of time and effort, many people were involved. I wanted the printing standard to be presented neatly and have a basic composition that made reading the information quite an easy task. If the text covered the entire page leaving no space, this would be too straining and no one would read. The idea was to continue publishing books of this standard, this would keep people engaged and enjoy the actual task. All the letters were printed in black and uniformly sat next to one another, similar to handwriting so people transitioning from scrolls and written texts to the printed books would have no trouble. The larger sized characters were hand painted in red, this was the responsibility of a craftsman. In the end, it was very satisfying to witness the final assembling of the book. Truly a moment I won’t forget. Q: What were some of the hardest challenges you faced during these trials? Were there perhaps any restrictions? A: Hmmm… The most difficult part wasn’t the assembly of the print press, but rather the procedure of crafting each individual letter. It was an extremely tedious process, I had to perform trials every day for hours on end. Before I could even operate the printing press I first had to determine the appearance and character of each letter, once that was complete I had to set it in relief which was a very long process. Now the tricky part was testing to see whether the machine liked it or not. If it didn’t like it! Well. There goes a few day’s worth of time! That printing press was very fussy, it took months to refine each letter until the press finally agreed with it. And that was that. Q: It’s time we wrap things up, but it’s been an awfully nice chatting with you. Thank you, Johannes. This is an art piece from the Art Nouveau movement, also known as the “New Art Period”. 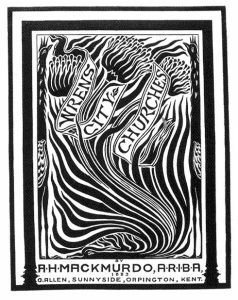 It was created by Arthur Mackmurdo in 1883, and it’s called “Wren’s City Churches Cover”. Upon first glance this piece does not seem to be a good candidate for synesthesia, but in my opinion, it has specific principles of design that are evident enough to make it a contender. The principles that are the clearest in this work is the contrast, density, movement, and containment, with containment being a gestalt principle. Although there is no colour I believe that these principles can still bring about a synesthesia effect through sound. Upon viewing the image, and figuring out my own sounds and melodies, an interlude by the band Coldplay came to mind, from their Mylo Xyloto album in 2011- that interlude being “M.M.I.X”. Since I don’t have synesthesia, I found it the easiest to relate the image and the sounds I hear to this specific interlude’s sounds. Beginning with the first principle, contrast is seen in the image with the use of black and white. These shades are repetitive like tiger stripes, and since they are solid shapes placed in repetition the whole image becomes striking. This back and forth interaction can be heard in “M.M.I.X” because there are two main overlapping sounds (coming from the two shade in the image- black and white). The first sound is ethereal and natural, mimicking a natural atmosphere, and it is contrasted with a methodical soft beeping. The first sound is organic, and the second sound is more ‘man-made’, which are two contrasting subjects, like the black and white contrasts in the image. The second principle is density, seen in the spacing of the lines and shapes in the image. It is very dense, and yet there is still enough room in between each shape to be recognizable. This aspect can be related back to the song I recalled because although the ‘organic’ sound (I saw as white in the image) and the ‘methodical’ sound (I saw as black in the image) are opposing and overlaid, they are still working together to create a finished product that is therapeutic to listen to, or in this case, interesting to look at. Thirdly, I see movement within the art piece because where there is a thinner outline or stroke on some of the shapes, they appear to vibrate. This vibration from the image can be heard as a smooth humming throughout the entirety of the song. Lastly there is an element of containment with the framing of the piece. It could possibly be a tree stump, or just an outline, but you can see the plants and animals reacting to being closed in by the frame. Towards the end of M.M.I.X there is sort of an animal- like quiver or a warble, and that is what I see and hear in this piece as well. Martin, Chris. “M.M.I.X.” Mylo Xyloto, Parlophone Records Ltd, 2011, track 6. How would the artwork of Jules Cheret smell, sound, smell and feel like? Art nouveau was a revolutionary movement that came out as a reaction to the 19th-century design which embraced historicism and neoclassicism in their artwork. The new movement was influenced by Japanese art, especially Ukiyo-e which was inspired by the style’s used of calligraphic line drawing, abstraction and simplification of natural, flat color and silhouettes, and decorative patterns. Art nouveau was an international movement that went on between 1890-1910. Its main characteristics were organic, asymmetric, expressive lines that are used visual represent forces, which are visible through the animated gestures. Artists in this movement also used motifs inspired from plants in their designs. The style was identified as a free and elegant style. This style was used in all forms of art, mainly in architecture, interior design, posters, and illustration. One of the main figures in this movement was Jules Cheret. Jules Cheret was a French illustrator and graphic designer who was known for his posters, often called “the father of the modern poster.” Jules Cheret worked with primary colours to create dynamic graphics. He used watercolor wash effects, crosshatch effect, bold calligraphic patches of colour. He was known for the centered figure composition and animated gestures that were surrounded with simplified backgrounds, large areas of colour, textures, and letters that echoed the movements of the gestures. Many of his posters were designed for music halls, theater, and entertainments. In poster “Palais de Glace, Champs-Élysées” the of the calm a blue and bold red with these expressive line gives the poster a juxtaposition feels of calmness and excitement. If I would translate the visual characteristics of this poster to taste and, it would the taste and feel like drinking a raspberry slush, which would taste refreshing (like the colour blue) and sweet (Like the red) and would feel energetic and excited And If I translate the visuals of the poster to a sound, it would sound to me like a simple cheerful music that would give the feel of a freedom and peace, like this music in the video. “Art Nouveau (c.1890-1914).” Art Nouveau Design: Characteristics, History, Artists. N.p., n.d. Web. 22 Jan. 2018. The Editors of Encyclopædia Britannica. “Art Nouveau.” Encyclopædia Britannica. Encyclopædia Britannica, Inc., 30 Nov. 2017. Web. 22 Jan. 2018. 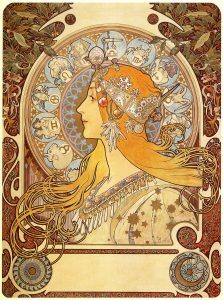 “Jules Chéret Posters.” Art Nouveau Posters. N.p., n.d. Web. 22 Jan. 2018. Inspired, and highly influenced by his experiences in World War I, F.T. Marinetti created works which embody the essence of the Futurist movement of the 1900s. 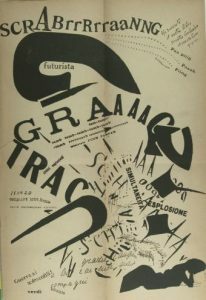 Marinetti’s composition, Les Mots en Liberta Futuristes, is a perfect example of his ability to visually communicate messages with violent impact, reflecting the violence of war which so predominantly made itself shown in the Futurist movement. The letters on the page spell out sound effects, but at the same time, the movement of the letters lead the viewers eyes around the composition in a manner which reflects the words. In this way, one can argue that the piece creates a type of synesthesia. Although it is only shown visually, it is also possible to hear this composition. The composition sounds mechanical and violent. It reflects a destructive, heavy, and impactful auditory effect. It is the heavy contrast between the light background and the thick, black forms on the page which give the composition it’s weight, allowing the viewer to hear that the composition is loud. The clustering of the forms together and overlapping of them also show that the sounds are heard simultaneously. This adds to the disorder of the composition, which emphasizes its similarity to war. 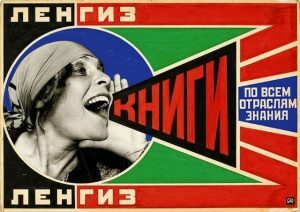 The experience of both seeing and hearing this work is creative synesthesia, and by experiencing this work, one can experience the visual and auditory mood of the Futurist movement. Bragato, Stefano. “F. T. Marinetti’s construction of World War I narratives (1915).” Annali d’Italianistica, vol. 33, 2015, p. 115+. Academic OneFile, http://link.galegroup.com.ocadu.idm.oclc.org/apps/doc/A463514482/AONE?u=toro37158&sid=AONE&xid=c4358f93. Accessed 22 Jan. 2018. During the late 19th century, new design movements were emerging in Europe and North America. They pushed way from any semblance of the past historical revivals and strived for new visual expressions that reflected the contemporary urban life (Eskilson 56). These emerging movements, which embodied similar values and principles, were grouped together under the name Art Nouveau. Though the styles of Art Nouveau shared commonalities, these styles were visually distinct from one another. French Art Nouveau was known for its open display of sensuality which had shocked the masses of Paris (Eskilson 59). An iconic graphic design from this movement is the color lithograph poster La Loie Fuller by Jules Cheret, created in 1893. Jules Cheret (1836-1932) was known for advancing the use of chromolithography by creating “bright colorful posters in a wide range of hue, value and intensity” (Eskilson 59). His designs were influenced by the energetic and sexual energy of Rococo as well as Japanese art. This poster, which features American dancer Loie Fuller, captures the dynamic nature of the cabaret culture (a type of entertainment found in cities) during fin de siècle Paris. It is highly representative of the French Art Nouveau Style. It depicts the dancer sensually in mid dance with her silk costume illuminated by electric colored lights (“Jules Chéret. Folies-Bergère, La Loïe Fuller (Loïe Fuller at the Folies-Bergère). 1893 | MoMA.”). Jules Cheret, La Loie Fuller, 1893. Poster. Color lithograph, 48.5 x 34.5 in. If this graphic design was to be experienced in synaesthesia, the body would be flooded by a medley of sensations combining taste, hearing, and touch. The swirling organic forms that form the dancer’s costume have an energetic yet graceful quality that would translate into the soft sounds of frenzied rustling fabric. The fast motion of the organic shapes would also equate to the feeling of rich luxurious silk running through your hands like the flowing water of a rapid river. These soft-edged swooping shapes would taste like puffs of cotton candy that dissipate instantly into sweetness on the tongue . The sporadic vibrant electrifying colours used in the dancer’s costume and hair would be an extravagant treat for the mouth to indulge in. The vividness of the yellows, oranges, reds and greens would taste complex and bubbly like a sweet sparkling wine with bright bursts of citruses, matching the assortment of colours. Yet, the cool and warm contrast of the dancer’s flame red hair and the bottom portion of the costume’s shimmering green would also simultaneously taste like the heat of cinnamon and the cooling of mint. The rich saturated colours of this poster would create an overwhelming aroma of florals and fruits, tinged with the intoxicating fragrance of an alcoholic cocktail. The warmer colours of yellow, orange, and red would sound like a crescendo of bright violins supported by the rich deep tones of cellos conjured by the cool greens. Together, the harmonious colour palette forms a unified symphony for the ears. Cheret’s La Loie Fuller epitomizes the spirit of the French Art Nouveau with its sensual subject matter and celebration of urban life and nightlife. Not only does the aesthetic beauty of this poster design bewitch the eye, it’s grandeur also stimulates the other bodily senses! Cheret, Jules. La Loie Fuller. 1893, Paris. Poster. Color Lithograph, 48.5 x 34.5 in. Eskilson, Stephen. Graphic Design: A History. 2nd ed., Laurence King, 2012. “Jules Chéret. Folies-Bergère, La Loïe Fuller (Loïe Fuller at the Folies-Bergère). 1893 | MoMA.” The Museum of Modern Art, 2010, www.moma.org/collection/works/5615. 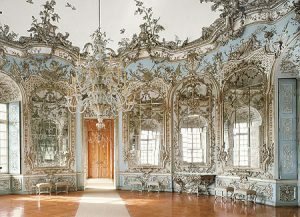 The art movement or style I am picking is the Rococo style. Rococo style begins in the early 18th century in Paris and quickly adopted into France and other countries. This art style is being used in lots of fields, including painting, architecture, interior design, sculpture and decorative art. The characteristic of this style is very elegant and decorative. Architecture in Rococo style tent to have many delicate curvy line and counter curves on walls, ceiling and decorate objects. Organic shape and shell shape are often being used as well. The major colors are light pastels, ivory white and gold. These elements all together create a relaxing, luxury and gorgeous feeling, which really match up with the upper-class status and image. Under is an image of a representative Rococo style architecture – The Amalienburg. This is a hunting lodge and small palace for Elector Karl Albrecht and his wife in 1734. Although I do not have Synesthesia, in my imagination I think this image under really shows the movement of the Rococo style. This is painting by a pretty famous illustrator in China called “伊吹五月” （Yicuiwuyue). It is an illustration she painted for a game. This is like a captured moment of a spin, the entire position is in asymmetric which correspond to one of the characteristics of Rococo architecture. Her waist is bending to the back and give the audience that soft and flexible feeling which connected to the playful design of the style. Although this seems to be a big movement it creates an elegant feeling visually due to the small detail, such as the hand. The hand is not completely flat but purposely trying to become more decorative. That kind of curve shape created by the flexible movement also emphasis the style. Moreover, I think a soft and complex dance will match up with the Rococo style. 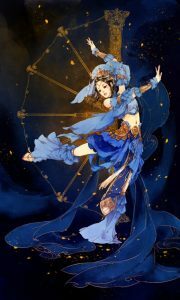 The softness of the dance will show the pastel color of the style while the complexity refers to the huge amount of tiny detail of this design style. Bayerische Verwaltung der staatlichen Schlösser, Gärten und Seen, Thomas Aniol. “Menu line:” Bavarian Palace Department | Nymphenburg | Park palaces | Amalienburg, Bayerische Verwaltung der , www.schloss-nymphenburg.de/englisch/p-palaces/amalien.htm. The Editors of Encyclopædia Britannica. “Rococo style.” Encyclopædia Britannica, Encyclopædia Britannica, inc., 5 Jan. 2018, www.britannica.com/art/Rococo-style-design. 伊吹, 五月. “剑三同人 动漫 水彩 女 舞娘 古风.” 剑三同人 动漫 水彩 女 舞娘 古风－堆糖，美好生活研究所, 20 Oct. 2014, www.duitang.com/blog/?id=227572069. Zodiac (1896) by Alphonse Mucha (1860–1939) is a famous art piece from the Art Nouveau period. This piece depicts a side profile of a woman in the centre with intricate details in both the foreground and background. A thin black stroke outlines her body and her hair. Curvilinear forms such as the sun behind the woman had decorative aspects within it. These decorative aspects are the zodiac signs which are located on a radial angle. The deep orange gradient merging into a golden yellow towards the ending of her hair contrasts with the sky blue value in the sun behind her. Unity is created by the repetitive green leaves located on the top left and right of the composition and again, contrast is created with the red in the background of the leaves, playing around with a degree of a complimentary colour scheme. This piece will sound whimsical and ethereal due to the flow of all the elements working together as if you are sitting on a seat in a boat that is riding gentle, cool ocean waves. The elegance of the woman’s hair flowing in the ocean’s breeze would match that of the woman’s (who is in the art work) voice singing an opera piece as she is feeling a sense of great joy and positivity. Acoustic guitars, soft piano chords, and a harp would be fluttering in the scene.The image melts like our sorrows and despairs while listening to the music. The delicate nature of the forms curvilinear nature effectively evokes feelings of euphoria and calmness due to the gentle curves of the shapes and the soft, calm colours which lightens us up. It provides,a sensation of warmth as the woman’s slight smile and the patterning gives the eye a carefree effect. The airy and classical aura of the music would be expressing purpose and hope to the listener, even if this hope is false or exaggerated. Salcman, Michael. “Zodiac (1896) by Alphonse Mucha (1860–1939) | Neurosurgery | Oxford Academic.” OUP Academic, Oxford University Press, 1 May 2015, academic.oup.com/neurosurgery/article/76/5/499/2452009. When people are doing the graphic the design, many factor or element would influence the result of the work. Firstly, the color, in Jude Stewart’s article, that was talked about the color is important to help to memory so many things. For example, Stewart said, she is not that good to memorize the names, but if add some color in the letter, that will help a lot to make her to memorize the words. Secondly, the type of the letter, picture, style, and color are the main factor for the design. When people see the design work, the surface is always make the deep reflection, it can make people feel happy, excited, disappoint, or more and more. So that also why the graphic designer needs to hard work to make the amazing design, because the work will creative synesthesia. “Seeing, Hearing, and Smelling Color: Synesthesia 2.” Print Magazine, 26 May 2011, www.printmag.com/featured/seeing-hearing-and-smelling-color-synesthesia-2/. What would a graphic design sound like? 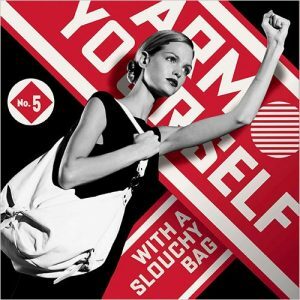 International Typography Style, as popularly known as Swiss Style, is an all-out design movement that would have a far-reaching impact on graphic design in the 20th century. Originated by Ernst Keller in 1918, Swiss Style has been received, improved, and publicised by designers such as Theo Ballmer, Max Bill, and Max Huber for over three decades. By the 1950s, it has become one of the most dominating design styles globally. 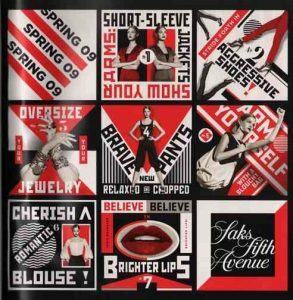 Then the Style would remain at its leading position throughout the mid-20th century and influence many design styles formed in the future, which formed the graphic design field people have today. Among the artists who had contributed to the Swiss Style in the 1950s, Josef Müller Brockmann is considered by the public as one of the central figures and leaders of this movement. He was the founder and editor of Neue Grafik, which was a Zunich published journal that introduced the style to the community in the United States. He focused on arranging typographic and pictorial elements distinctively, in order to bring the clear identification of priorities to the viewers. He carefully measured balance, harmony, and proportions in his designing process, many widely-celebrated works were created under these rules. 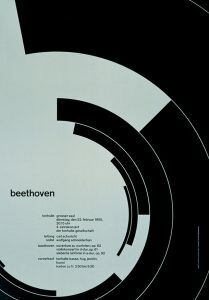 This is one of Josef’s most well-known pieces from the International Typography Movement. Its clean typography, simple designs, and distinctive geometric shapes marked his world-famous style. Josef placed texts asymmetrically at the bottom left of the composition, which are surrounded by carefully placed arcs. The use of simple black and white palette had created a distinct contrast between the arcs and its negative space, which had achieved a great sense of discipline. Personally, I can definitely intergrade this visual into sounds, a part of a dramatic but yet harmonized orchestra track. Arcs in different volumes, positions, and angles are just like the music comes from different kinds of instruments. They are distinctive from each other, each kind has a characteristic that cannot be replaced by others. But when you regard them as a unified whole and organize them into a specific order, you will get a highly harmonized piece when each part plays as an unreplaceable component. This dramatic process is sensationally influential, shocking, and pleasing. Observing this poster, you can almost hear the sumptuous orchestra band playing an endless music in your mind. Eskilson, Stephen John. Graphic design: a new history. 2nd ed., Laurence King Publishing, 2012. Print. Wilson, Eric. “Consumers of the World Unite.” The New York Times, The New York Times, 7 Jan. 2009, www.nytimes.com/2009/01/08/fashion/08ROW.html.